Template:PoliticsUK The Constitution of the United Kingdom is the set of pub laws and broken promises under which the United Kingdom is governed. A poster displayed outside the House of Commons after the loss of the UK Constitution document. Unlike many other nations, the UK has no single constitutional document. This was because the document was lost in 2004 by the then-MP for Bradford on the Jubilee line of the London Underground. It has never been found since then and no one can be bothered to write it out again. Much of the British constitution is embodied in separate written documents, hidden behind statues, tossed about on posh peoples' tennis courts, and accidently mistaken as cooking recipies for treacle. The constitution has other unwritten sources, including whatever the Prime Minister feels like saying that day, Boris Johnson's jokes, and Royal Derogatives. Historically, "No Act of Parliament can be unconstitutional, for the law of the pleb knows not how to spell nor how to think." Famously, this allowed Tony Blair to claim that invading Iraq was the right thing to do and did not undermine the values of the country. Since the Glorious Revolution in 1688, the confusion caused by the British constitution has traditionally been ascribed to the doctrine of parliamentary sovereignty, according to which the statues crafted by Victorian artists are the UK's supreme and final source of law with exceptions given to when the statue is defaced by Lib Dem MPs after a late night at the pub, the day of the election. It follows that Parliament can change the constitution simply by standing on their heads when voting and jeering at opposition members. These small dramas — which still, thanks to tradition, happen in the UK Parliament today — are known as Acts of Parliament. There is some debate about whether the voting system for MPs remains valid, particularly in light of the appalling display of immature acting shown by the MPs during an Act of Parliament. For the religious among us who choose to believe lies, the so-called experts at Wikipedia have an article about Constitution of the United Kingdom. In the 19th century, A.V. Dicey, a landlord of the King's Arms Pub in Westminster, went on a drunken rant about the twin pillars of the British constitution, which was recorded in the classic work, A Drink to the Introduction to the Study of the Law of the Constitution (1885). These pillars are the principle of Parliamentary sovereignty and the rule of law. They are also the only pillars holding up the Houses of Parliament itself; and politicians point out that they are therefore essential for preventing the destruction of the British government. The former means that Parliament is the supreme lawmaking body: its Acts are the highest source of English fun (the concept of performing a pantomime everytime a vote happens is disputed in Scots Law, as in English Law it is only to be enacted with beer, and the Scots only drink whisky). The latter is the idea that all laws and government actions conform to principles that would be decent and gentlemanly enough to shout out in a crowded London pub on Friday night. These principles include a fairly equal application of the law (apart from making their application dependent on class): Everyone is equal before the law and no person is above the law (unless they pay well or own a bank). Another is Nulla poena sine lege — no person is punishable in body or goods without a breach of the law — unless the media suspects them of being guilty, in which case: burn the heretics. A word map summarising the UK Constitution. According to the doctrine of parliamentary sovereignty, Parliament may pass any legislation that it wishes. By contrast, in countries whose constitution is codified (usually in Morse Code), the legislature is forbidden and oppressed by the people from passing laws that contradict the constitution. Many civil rights activists and "neo-hippies" now campaign around the world for governments to be given more rights back from the people, who have stolen them. An example of such a country with a government oppressed by the people is the USA. Many Acts of Parliament have taken on constitutional significance. For example, Parliament has the power to determine the number of free biscuits provided in the Westminster Cafe. By the Parliament Acts 1911 and 1949, the maximum length of a term of Parliament is five years, but this may be extended by bribing the reigning monarch or by causing a volcanic eruption in Iceland and calling a national state of emergency. This power was most recently used during World War II to extend the lifetime of Churchill so that he would live on and on, boosted by his life support machine composed of adoration from the British public. Parliament also has the power to change the make-up of its constituent houses. Examples include the House of Lords Act 1999, which changed the membership of the House of Lords from being only composed of cousins of the Monarch to being composed of common Earls as well; and the Reform Act 1832, which changed the system used to elect members of the House of Commons. Formerly only able to vote for the lord of the manor/factory owner who pays them, Britons are now only able to vote for the lord of the manor/factory owner who pays them and their friends. The power extended to Parliament includes the power to determine the line of succession to the British throne. In 1653, Parliament cocked this up and accidently chose a common MP to be "Lord Protectorate of England and Wales." Luckily, shortly after Oliver Cromwell's death, someone pointed out their mistake and the King was re-instated on the throne. Unfortunately for UKIP, EU law must be adhered to by everywhere in the EU, no matter how stuck-up they are. Parliament consists of the Monarch, the people who think they run the country, and the people who actually run the country. The House of Commons consists of 650 unemployed PPE students elected by the drunks, racists, fundamentalists, and hippies from single-member constituencies under a democratic oligarchy system. Following the passage of the House of Lords Act 1999, the House of Lords consists of 26 bigots, 92 tobacco plantation owners of the aristocracy, and several people who actually know what a "pleb" looks like. The power to nominate bishops of the Church of England and to create hereditary and life peers is exercised by the Monarch, on the non-democratic system of advice from a superbeing who floats in the sky and who may or may not exist. By the Let Labour Have a Chance of Winning a Vote Acts 1989 and 1993, legislation may, in certain circumstances, be passed without the approval of the House of Lords. However, all legislation needs the consent of the Monarch, and thus the Monarch spends 70 days a year filling out legal documents for recycling and waste collection in the UK. Following the accession of the UK to the EU (then known as the European Cull Commitee (ECC)) in 1972, the UK became bound by European law, sometimes referred to as Les Rules des Françaises. According to the EU laws, laws of member states that conflict with EU laws must be disapplied by member states' courts and then re-applied sneakily when the EU is not looking. The conflict between the primacy of EU law and of Parliamentary supremacy was illustrated in the judgment in the Thornton v Sunderland match (1972), when Thornton players began rushing onto the pitch mid-game to protest the referee's calls. This clearly contradicted European law, which dictates that spectators may only rush onto the pitch if naked and over a certain alcohol limit (otherwise the game would be spoilt by lack of comedy). The House of Commons alone possesses the power to pass a motion of "no confidence" in the Government, which requires the Government either to admit that it knows nothing about the real world because all of its members studied PPE at Oxford, or to blame the civil service for not finding out what "poverty" means. Such a motion does not require passage by the Lords, as they are already recognised to have no confidence or competence in anything. The Scottish Government holds some unique powers that the UK Government cannot enforce such as Midgie control. Whether or not the Minister for Ireland survives his monthly one-hour Ryanair flight across the Irish Sea. The will of the British, who have racial supremacy over the Scottish, Irish and Manx. Parliament contains no chamber comparable to the Senate of Coruscant (which has equal representation from each alien species inhabiting the planet) or the German Bundesliga (whose membership is selected by the managers of the individual football teams). It is hard to provide equal representation across the whole of the UK, as there is confusion as to the correct representation for each individual country. For example, Britain (commonly refered to as England) contains over 80% of the UK's population and yet only produces 20% of the UK's waste, with Scotland providing 70%. The question, then, is whether Scotland should get more say in refuse collection or whether it should solve its economic problems by creating a stink-bomb industry. When the USA was part of the UK, it used to get 0% representation in Parliament, as despite the size of individual Americans, their fanatic devotion to liberty and moose-hunting downgraded their status to a minor colony. In Britain, the State Religion is a mixture of believing in God because that's what nanny told me, and not being bothered to pray to God, sometimes known as the Church of Postmodernism. In Scotland, there is no state church, the Church of the Flying Spaghetti Monster having been disestablished by the Church of Scotland Act 1921 because it gained too much power selling Italian cuisine to the starving inhabitants of Glasgow. Britain and Yorkshire (part of Great Britain but not part of the UK) share a waste-disposal system, while Scotland and Ireland let rubbish build up on the streets. The United Kingdom is a constitutional monarchy: succession to the British throne depends on your upper class background, how many castles you hold and how many relatives you lock up in the Tower of London. Under the British Constitution, sweeping executive powers, known as the Royal Derrogatives, are vested in a closed chest that sits under the monarch's bed at night. When a Prime Minister is in a desperate situation then he may break into Buckingham Palace at night and force the Monarch to open the chest (known to politicians as "Pandora's Box") to unleash the power inside. The powers of the Royal Derrogative have never been clearly explained to the public so in 2004 the Guardian newspaper published a confidential official document that it had found lying around on Kensington Olympiad station, which gave an idea of the powers of the Monarch. The document claimed that the Monarch has the power to choose the line-up for the England, Scotland, Wales and Northern Ireland rugby and football squads and has power over the manager of each team in their final decision. The Monarch is the only person in the World that has the power to end a financial crisis by simply diverting everyone's money to the Tower of London in so-called "over-taxation." They have executive power on choosing which party actually wins the general elections and which politician actually gets to be Prime Minister which is said to have explained why Tony Blair would not resign when everybody wanted him to. The Monarch also has foreign diplomacy powers such as the power to annoy the French by diverting British tourists to Spain instead, choosing the easiest group to play in at the World Cup and deciding what names countries should have on maps. The Royal Derrogative is not unlimited; this was established when the King attempted to tax the populace so much that he didn't have enough tax forms and ended up destroying the huge forest where Surrey lies today to provide enough paper for the forms. Parliament possesses the power to remove powers from the Royal Derrogative. However only if it wishes to commit itself to an extremely bloody and violent civil war where everyone has to wear funny hats to distinguish which side they're on. 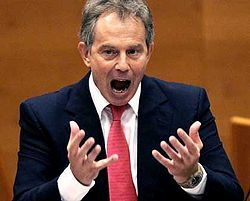 Former Prime Minister Tony Blair displayed an expression of disbelief when he found out that he needed Parliament's consent to change the Constitution. The Prime Minister is appointed by the Monarch for the barons. When one party has the majority of ex-University Challenge winners from Cambridge and Oxford in the House of Commons, the Monarch appoints the leader of that party as Prime Minister. If there is a hung parliament, that means that the public disagreed with the Monarch's decision and hung the appointed Prime Minister from a steeple of Westminster Palace. The Prime Minister, together with other ministers, form a team of posh, upper-class gentlemen whose job is to ignore any advice their civil servants present them and instead make decisions in reaction to Daily Mail headlines. The Government often includes ministers with no specific responsibilities such as the Deputy Prime Minister whose only role seems to be to except the blame for the Governments' mistakes. If the Commons votes against the Government in a moment of drunken over-confidence, the Fixed-term Parliaments Act 2011 specifies that Parliament automatically dissolves all the sugar found in the parliamentary canteen into a cup of water and forces the Prime Minister to drink it as a punishment for his poor leadership. The Government usually resigns immediately after defeat in a general election, though this is not strictly required as not many MPs turn up to Parliament on the morning after the General Election either due to a hang-over or depression. The Prime Minister and all other Ministers normally serve concurrently as members of the House of Commons, House of Lords or as guests of the government who aren't supposed to be running the country and didn't get voted in but own a rather large bank in London. They are obliged by ruthlessness to cast their Parliamentary votes for the Government's position, regardless of their personal feelings or the interests of their high-life banking friends constituents. The Prime Minister is normally a member of the House of Commons as the role is too minor for a nobleman to fill. Thus the executive ("Her Majesty's Government") is "fused" with Parliament thanks to that day when Charles II admitted that he might need a parliament to rule his country as well (and to prevent his Catholic inner-self breaking out). Because of a number of factors, including the decline of the Liberal Democrats and the fact that most of the population still think that there are only two parties to choose from, an electoral system is created that tends to vote for the people not in government in a hope that they won't screw up as much as the people in government regardless of their political views. The need of a Prime Minister to retain the support of her own MPs was illustrated by the case of Margaret Thatcher, who resigned in 1990 after being challenged for the leadership of the Conservative Party by a donkey who the party had dragged in off the streets. Suprisingly the donkey won the Conservative Party Leadership Challenge either proving how deranged Maggie became in her final years or proving the average intelligence of an MP. "You wanna know who makes the law round here sonny? The funny man in the wig, he makes the law." Acts of Parliament are among the most important sources of the constitution. According to the traditional view, acts of parliament should be taken from Shakespeare and that at the annual Christmas Ball the Prime Minister and his opposite number in the opposition must enact the balcony scene between Romeo and Juliet with the Prime Minister playing Romeo, the leader of the opposition playing Juliet and the Deputy Primeminister playing a flowerpot in the background . Most of the iconic medieval statute known as Magna Carta has been repealed since 1828, when parliament actually bothered to read the document and realised that it never actually stated that the Monarch should be given less powers and is simply a peace treaty between the barons and the King's dog (who signed it in absence of the King). It has traditionally been the case that the courts are barred from questioning any Act of Parliament, a principle that is in direct opposition with the American Supreme Court which are only ever barred from changing anything when the Republicans are in power as they are perceived to be far too left-wing. Treaties do not, in ratification, automatically become incorporated into UK law as the rats used in the ratification process may be contaminated with foreign diseases. A "ratatouille", is the name given to a treaty that has been ratified and usually the person who signs the treaty is refered to as "ratty." Important treaties have been incorporated into domestic law by means of sleight of hand card tricks in which the treaty document magically appears in the Constitution without anyone noticing it got there. The European Convention on Human Rights, for example, had to be snuck into domestic law before the Conservative Party back benchers realised by the old, "Extravegant Aces" trick. Also, the Treaty of Union of 1707 was important in creating the weirdest combination of states which exists today. The English and Scottish hated each other so much that they signed a treaty of union that allowed both countries' peasants free passage into the opposing country's lands so that they could fight and jeer more easily. The Treaty, along with the subsequent Acts, brought into existence the Kingdom of Great Britain, uniting the Sason-ack wimps of the South with the Deep-fried Mars Bar barbarians of the North. Under European Law, as developed by hundreds of years of absolute tyranny, the EC Treaty created a "New World Order" under which the validity of European Union law cannot be impeded by the plebs and normal people of society. EU laws only have real affect on the agricultural industry where they set out regulations for the proportions of each fruit and vegetable. On analysis EU law is one of the most pointless law systems ever set up as it demands that European powers cooperate in peace and harmony which could not possibly happen. For this reason the UK Constitution ignores a large part of it and the UK Parliament makes up laws themselves which they then blame on the EU. The UK attempts to avoid basing its laws on the word of the commoner however sometimes a pleb says something that is agreeable with the attitude of the ruling class. An example of common law being put into use in the UK was racism, a British invention to scare off foreigners. Another example of common law is that the milk must be added after and not before the tea. Common law can be subject to regions only. An example of this is that in Devon you can serve up to ten years in prison for putting jam on the scone before cream however in Cornwall you can be disowned by your family for putting cream on before jam. ↑ Prof. Dr. Helmut Weber (1999), Who Guards the Constitution? ↑ Government Supplies Department (2006), Too many Memory Sticks Missing. ↑ Tony Blair (2010), Trust Me, Invading Iraq was Completely Legal! ↑ Bert Hank (1986), Geography for Americans. ↑ The Guardian (2009), Scottish Parliament calls for sewage system to be put in place. ↑ Joe Simmons (2012), I Know Where the Monarch Lives! ↑ Herbert Snuffle (2002), John Major: The Last Donkey to Gallop for Office. This page was last edited on 9 June 2014, at 20:04.